I have a question for Dr. Robert Pincus. I was prescribed oral steroids (methylprednisolone 4mg) due to loss of smell. I took the 7 day regime of oral steroids. About 10 days after completing this treatment I again lost my sense of smell. My doctor said this could not be treated. I am seeking a second opinion from you. Thank you for any information you can provide. Thank you for your question. It is not hopeless when you have lost your sense of smell. There are two main reasons that we lose the sense of smell. The first and most common is that there is congestion in the nose at the area of the cribriform plate (the top of the nasal cavity) where the smell fibers are located. This happens when we have a cold or often from a sinus infection or nasal polyps. Obviously, these are not only treatable, but will almost always get better. Damage to the smell fibers themselves, either after a viral infection, trauma, breathing in certain toxins, or other causes are more difficult to treat. At the NY Sinus Center we believe it is important to find out what has caused your loss of smell and aim our treatments at the particular cause of your problem. The fact that your smell improved temporarily with oral steroids is an EXCELLENT sign that your sense of smell is both treatable and more likely to be regained. We would be happy to try to help. I lost my sense of smell after a dental extraction. Will it come back? Question: I am experiencing a lost sense of smell after surgery. I had an upper left molar tooth extracted last month. The extraction was painful, for more than 20 min. the dentist pushed my head, pulled and twisted the molar. I had a sinus perforation which later was confirmed through a dental x-ray (not panoramic or whole head). Please can someone tell me whether my anosmia is going to be permanent (one month already) and whether I might have had the CSF leak due to the blunt trauma of the tooth extraction and sinus perforation? The liquid did not resemble any mucus, it was watery and sudden gush. I am still waiting for the day where a surgery will be done to close the sinus communication via cutting and stitching on my gums (it will be after 3 weeks). Is anosmia typical for sinus perforation? I have a burning sensation in the base of my left nostril and a feeling of excessive dryness. For a week or so I started having a mucous liquid running down to my throat, I am sure that this is from the sinus. It is not rare for someone experience a lost sense of smell after surgery. Typically because they develop a sinus infection after an upper molar infection or extraction. The roots of the upper molars are very close to and sometimes in the maxillary sinus. The bacteria that we have in our mouth can then spread into the sinus easily causing infection. The bacteria of the oral cavity, in particular, tend to be worse than those we have living normally in our nose and sinuses, and can cause quite significant infections. It seems likely, that you had a sinus infection from your dental problem. This needs to be treated aggressively, with antibiotics based on a culture of your sinus discharge- and sometimes by drainage- surgically or with a balloon sinuplasty (balloon dilating of the normal opening of the sinus – done in the office. You can certainly have a temporary- or even permanent loss of the sense of smell (anosmia) from infection. One needn’t postulate a break in the roof of the sinus (cribiform plate)- Although your description of the mucous drainage is consistent with a leak of brain fluid (CSF)- the best way to diagnose this would be to collect the fluid and to have it tested – (Beta Transferin is used as a marker)- Even less likely would be a leak of fracture of the petrous apex (inner ear)- as this usually will cause a hearing loss from fluid collecting in the middle ear- and will not often cause drainage through the nose. Lastly, one needs to find out the cause of your loss of smell to give you the best idea of how to treat this and whether the lost sense of smell after surgery will eventually disappear. Question: I have been suffering from anosmia since approximately July 2012. I had no illness around that time (have not had the flu since 2002), and had no injury of any kind. I do have strong hay fever allergies, but those have been present all my life. I have had an MRI done, and no one has ever identified anything wrong with it, nor has looking up my nose with an endoscope revealed anything. The reason for my email is this: All the doctors I have seen so far, once they are up to speed on the above information, have given up surprisingly quickly on the idea of trying anything. Are there any anosmia treatment options available? The loss of the sense of smell can be quite debilitating. The sense of smell is important for our day to day safety (to determine if food has gone bad or if there is a gas leak), for our enjoyment of life in general, and can be a precursor or indicator of other neurologic problems. Evaluation includes a thorough history, quantification by smell testing, ear nose, and throat evaluation and nasal endoscopy, and imaging studies such as an MRI. Many times, but not always, the loss of smell can be reversed or improved. Obstructing polyps can be shrunken or removed, inflammation- such as after a viral infection may be treated with steroids, orally or in the nose. Infection can be treated with appropriate antibiotics if needed. More recently, several studies have shown that in those people whose loss of smell persists, other newer therapies may be helpful. Theophylline has been used orally and often can be of help. 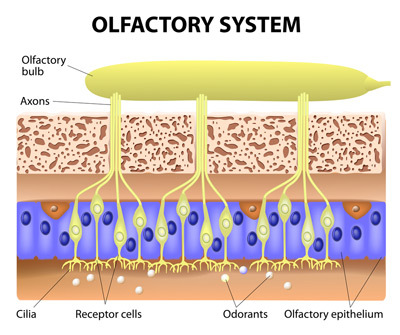 Smell therapy- also has been shown to be a benefit in many people as well. Unfortunately, oral theophylline has many side effects. We have been using a topical nasal spray with theophylline for such patients. The study results have been promising. We’d be happy to see you at the NY Sinus Center to review your previous studies and treatments to see if we could suggest other therapies- such as intranasal theophylline or smell therapy- and to make sure that no other treatable cause has been missed. Question: Is it normal for an increased amount of nasal mucus and drainage into the back of my throat 2 months after turbinid reduction surgery? I also have no sense of smell in the morning with my ability to smell increasing during the day. Even at it’s best, my ability to smell is greatly diminished. Answer : Thanks for your question. Turbinates are tubes on the side of the inside of the nose that help the nose serve its role as a humidifier and filter. At times these structures can become quite swollen and interfere with breathing. There are different procedures to shrink them, if other treatment fails, but today one almost never would remove them as their role is essential to the nose doing its job. Anything that causes congestion in the nose can temporarily limit your ability to smell. Typically turbinate surgery causes swelling and crusting and dried mucus in the nose- for a short term. Usually, this lasts a month or two, but can last longer. We tend to recommend nasal saline rinses, a humidifier in the bedroom at night- (if you are able to clean religiously)- and sometimes a nasal steroid spray (such as flonase/fluticason) for 2-3 months after the procedure to help bring down any swelling. If your problems persist, please check with your surgeon.